A team based in Nottingham have been honoured at the 2014 Light Rail Awards for their work on a major feat of civil engineering. The Taylor Woodrow Alstom joint venture received the Outstanding Engineering Achievement prize for their installation of the Karlsruhe Friendship Bridge over Nottingham station. 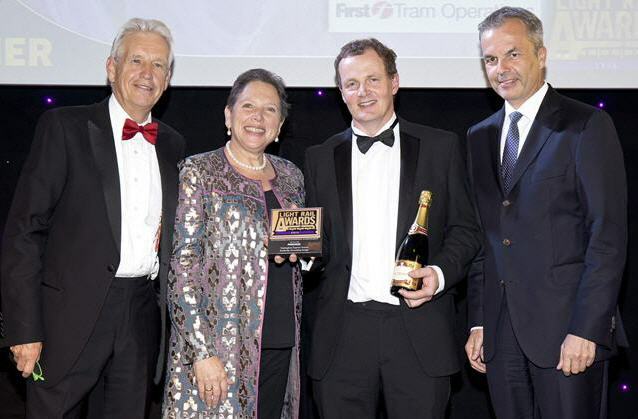 During a glittering ceremony in London’s Honourable Artillery Company headquarters, Senior Project Manager Andrew Bannier was presented with award by Transport Minister Baroness Kramer and veteran BBC news anchor Nicholas Owen. Forming an integral component of the Nottingham tram extension project (NET Phase Two), the 1,100 tonne bridge was manoeuvred into place, 10 metres per evening, over the course of several weeks.